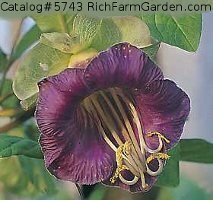 Cobaea, or Cup and Saucer Vine, a quick growing ornamental perennial vining plant native to Mexico and belonging to the Phlox family, Polemoniaceae. They are grown in cooler climates as annuals. 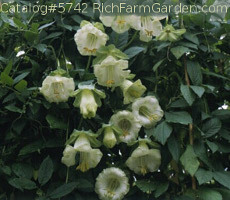 The plant has woody stems and bears large bell shaped blooms throughout the late spring, summer and fall. It quickly covers walls and trellises and is valuable for this purpose. Thriving in ordinary garden soil, and is best grown from seed sown in early spring. Seeds should be sown in pots, trays or a bed prepared with a soiless seed starting medium (1 part sphagnum peat moss to 1 part sand is fine). Sow the seed and cover lightly. The seeds should be placed in the planting medium on their sides, not flat on the soil. Maintain temperature at about 70F and keep the medium moist, but not soggy. When seedlings reach 2 inches in height, transplant to larger containers or, if outdoor temperatures remain above 55F, you may set the transplants in an outdoor prepared area. Seeds may also be sown directly outdoors when the outdoor temperatures remain above 55F.